Spalling is a term used to describe a structural condition for concrete, seen most visibly on the underside of the concrete form. In this article, we’re taking a close look at what causes spalling on balconies, and how it can be prevented. 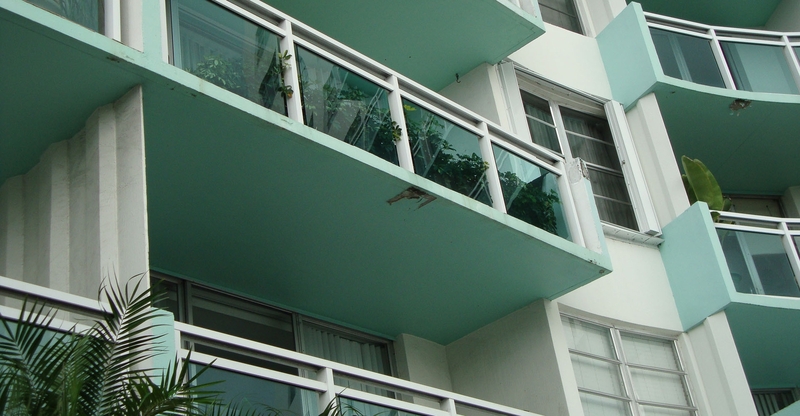 Balcony restoration and modernization is a key component of the work we do at Poma. For this reason, we find that it is crucial to understand how railing plays a role: a good railing design will protect your balcony. 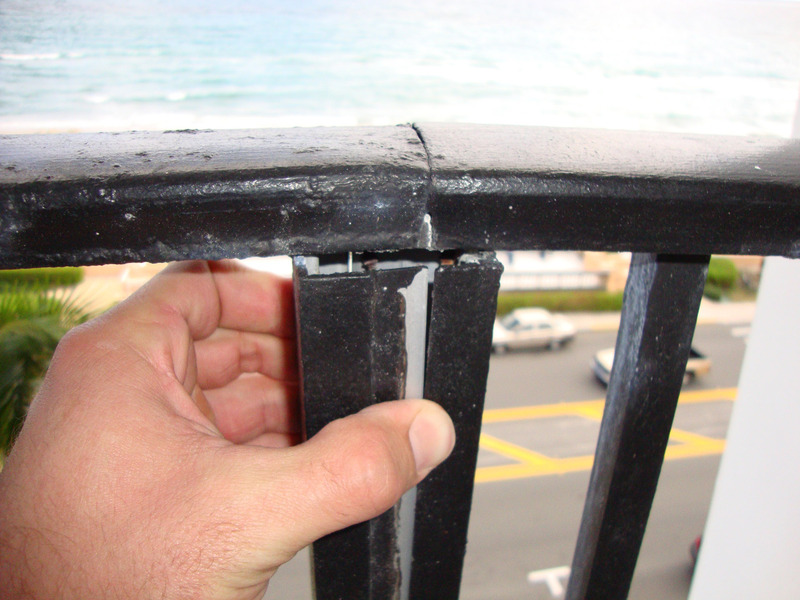 A bad railing installation on the other hand, can directly lead to major spalling issues. The term “spalling” specifically refers to the flaking and delamination of the concrete. This condition can be seen most visibly from the concrete’s underside. To detect spalling early, look for round depressions where the concrete surface connects along joints. You can also detect spalling early as rust-colored staining on the concrete surface. Rust isn’t always an indicator of spalling, but it warrants closer inspection. Water intrusion through the post can cause concrete spalling as seen here. What causes spalling in concrete? There are several causes of concrete spalling. When moisture and contaminants corrode the embedded steel in concrete, spalling is likely to occur. Salts and other corrosive elements combined with water are the main culprits. You’ll often see spalling happen in both colder climates where road salts are common. You’ll also see spalling happen in coastal environments where the ocean salts find their way into your concrete slabs. Salt acts a catalyst, causing a reaction with the water’s oxygen molecules to the reinforcing steel embedded in the concrete. The oxidation (rust) will cause the steel to expand and contract. This expansion stresses the concrete, and over time it will cause cracks to form. What causes spalling on Balconies? 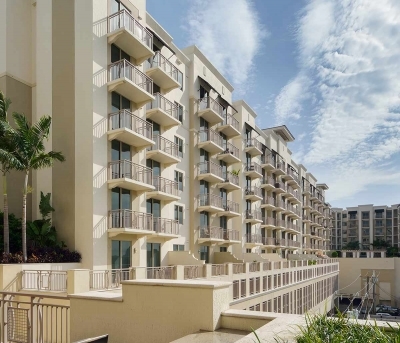 So now that you have a good understanding of how spalling works, how does that correlate to your ocean front condominium? 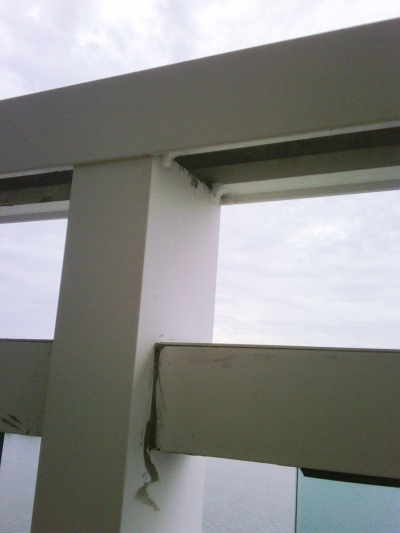 Balcony slabs on ocean front condominiums are fairly slim outcroppings with only a small layer of reinforced steel. It is of the upmost importance that this steel is protected from entry of moisture and contaminants. One of the biggest culprits of spalling on balconies is the installation and long-term performance of the balcony railing. This is why Poma develops high-performance guardrail systems that ensure longterm performance of both the rail as well as the concrete to which railings are installed. Low-performance balcony railing systems can cause spalling for a number of reasons. For example, many systems are built by coring wide holes into the concrete, or a post socket. This can easily damage the concrete’s internal reinforcing steel structure. 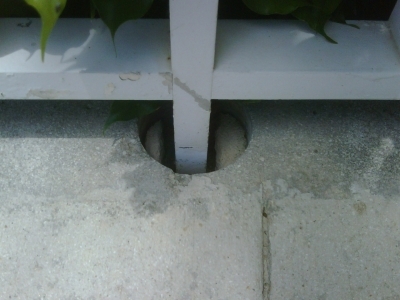 In addition, post sockets create an ongoing potential for unwanted moisture entry into the balcony’s concrete slab. Examples of post failures which may compound the effects of spalling. Another example of a problematic railing design is a basic metal system which can trap water at the base of the system. Many of these basic systems use square tube which can allow precipitation and moisture entry into the system. What to do if you see spalling? 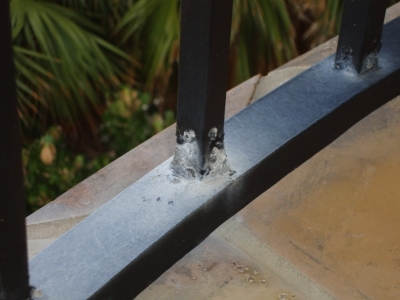 If you notice rust or corrosion at the base of your guardrail, it is a warning sign that your balcony is at risk for spalling. While your condo association manager may spot signs of spalling in visible areas, often building tenants have the most close relationship with their balconies. If you see signs of spalling on you should contact your building association manager to take a look and document these signs. Contacting a trusted building engineering or construction management firm is the first step towards rectifying spalling on a building. Poma’s partners and resources are a good place to find a good engineering team, or you can contact our team directly to determine the next steps for evaluating your buildings needs.